1) Pour first 5 ingredients in a shaker. Shake for 60 seconds. Pour into a glass with ice. 2) Add club soda and stir. 3) Float a 1/2 ounce of light rum 4) Garnish with sliced orange and cherry. 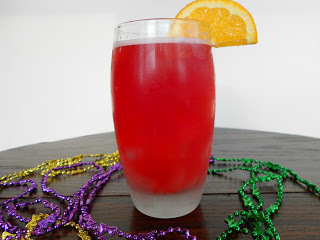 ← Mardi Gras Party Drinks…Celebrate!